Card Text Play: Capture 3 . Flavor text It doesn’t like to share. What happens if my opponent has less than 3 Æmber when I play Charette? Charette captures as much Æmber as it can, up to 3. 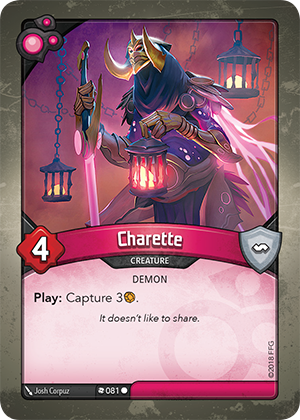 If your opponent has no Æmber, Charette captures none.